Sometimes cheap can be better. 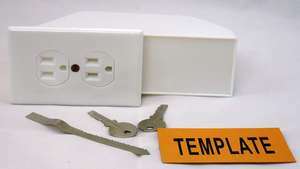 Rather than spending a pile of cash on an obvious home safe, or a floor safe which can be easily detected, a fake receptacle safe can be the way to go. You can purchase something like the one pictured above, or craft your own by disconnecting or hiding the wiring and using an empty receptacle box. OR maybe even get a drywall saw and "install" a new receptacle for The dimensions of such a unit usually are 5" high x 3.5" wide x 2.5" deep. That's plenty of space to hide your wedding rings, heirloom jewellery or any stash you want to keep others from finding. Most police statistics on home burglaries state that the average time a burglar spends in your home is less than 5-6 minutes, so its not likely that they will go removing all the receptacle covers inside your home to see if they are real. Just find the most out of the way spot to install it and away you go - to more peace of mind.